A 37-year-old woman of Ashkenazi Jewish descent, with a strong family history for breast cancer, had a mammogram performed as part of an annual exam. The imaging demonstrated clusters of heterogenous calcifications in the upper outer right breast. The patient was referred for an additional mammogram with spot magnification views. The second mammogram also showed numerous clusters of calcifications throughout the right upper outer breast, all having a similar appearance. The radiologist felt the findings were highly suspicious of malignancy (BIRADS 5). He recommended a biopsy of the right outer quadrant of the right breast. The following day, the patient underwent a stereotactic core needle biopsy of the segmental calcifications of the right breast. The pathologist reported the findings of intermediate grade ductal carcinoma in situ (DCIS) with necrosis and micro calcifications. The DCIS was identified as estrogen and progesterone receptor positive. The patient was referred to General Surgeon A. General Surgeon A discussed surgical options with the patient to include segmental mastectomy, total mastectomy, and bilateral mastectomy due to strong family history of breast cancer. The patient decided on a plan of bilateral mastectomy with reconstruction. She was anxious to proceed as she was looking for a new job and might be moving. General Surgeon A referred the patient to Oncologist A. Oncologist A decided not to use tamoxifen because the patient had a history of a liver resection for nodular hyperplasia that developed while she was taking oral contraceptives. 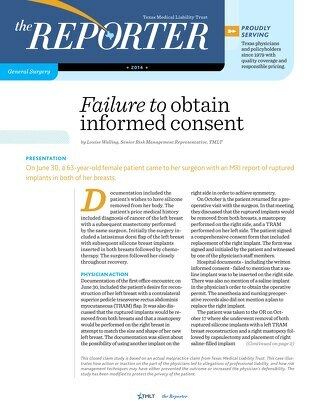 Oncologist A agreed with the bilateral mastectomy for risk reduction, and asked the patient to return after the procedure to make a final decision about chemotherapy once they had the pathology report. Oncologist A felt chemotherapy would not be needed if the pathology report indicated DCIS. General Surgeon A performed a bilateral total mastectomy with right sentinel node biopsies. Plastic Surgeon A then performed right and left reconstructions using deep inferior epigastric perforator (DIEP) flaps. 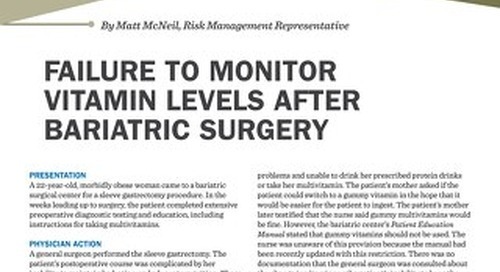 There were no frozen sections taken at the time of surgery to confirm clear margins. The pathology report demonstrated DCIS with scattered microcalcifications and focal necrosis. The DCIS was described as multifocal with the largest focus measuring at least 1 cm. The report also indicated there was DCIS involvement in the superficial margin. The sentinel lymph nodes were found to have isolated tumor cells with no aggregate greater than 0.2 mm. 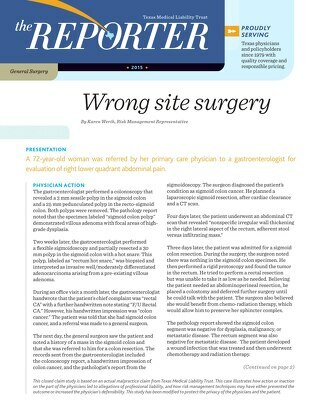 The patient saw General Surgeon A for her postoperative visit and they discussed the pathology report. General Surgeon A documented the findings of the pathology report in his dictated notes regarding the discussion with the patient. Those notes, however, did not mention that the superficial margin was not clear. General Surgeon A faxed a copy of his dictated notes and the pathology report to Oncologist A on the date of this postoperative visit. General Surgeon A recommended a follow-up visit with Plastic Surgeon A, follow-up visit with Oncologist A, and to follow up with him as needed. The patient saw Plastic Surgeon A the following day. The pathology report was in his chart, but the findings were not mentioned in his notes from the exam. The patient saw Oncologist A the next week. Despite having a copy of the pathology report, Oncologist A documented that the pathology showed negative margins and there was no evidence of metastatic disease. Oncologist A also felt the sentinel node findings represented a false positive based on recent studies that showed that positive sentinel nodes can arise from the procedure itself, especially when dealing with DCIS. Therefore, he did not feel the patient needed chemotherapy. Oncologist A noted that the patient was moving out of state and recommended oncology follow up, monitoring, and genetic testing. The patient moved to another state. Seven months after the mastectomy, she saw Oncologist B. It is not clear if Oncologist B had Oncologist A’s records at the time of this visit. Oncologist B’s notes focused on cancer surveillance and did not mention the previous pathology report or specific recommendations for breast cancer follow up. Eleven months later, the patient returned to Oncologist B due to concern about a lump in the right breast. A mammogram showed extensive calcifications and a poorly defined 12 x 15 mm density in the upper inner quadrant. A biopsy revealed infiltrating ductal carcinoma. The patient saw General Surgeon B and she recommended a resection of the mass, the “spared” skin, and any underlying breast tissue. General Surgeon B recommended management of the DIEP flap by Plastic Surgeon B. General Surgeon B performed the resection and the pathology report showed a 1.2 cm infiltrating ductal carcinoma with 3 negative lymph nodes. The patient also had DCIS that had again reached the superficial margin. The patient underwent adjuvant radiation therapy for four months. Oncologist B then placed the patient on a leuprolide regimen and monitoring. The patient was cancer free almost two years after the radiation therapy. 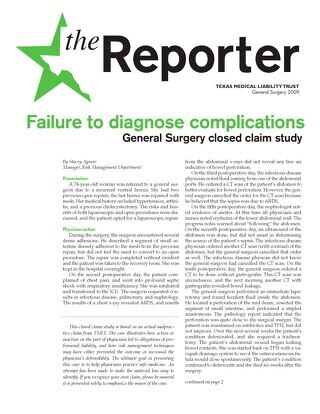 A lawsuit was filed against General Surgeon A, alleging negligence for failing to advise the patient that the pathology report reflected DCIS in the superficial margin. This negligence deprived the patient of the opportunity to have an immediate revision surgery to obtain clear margins. 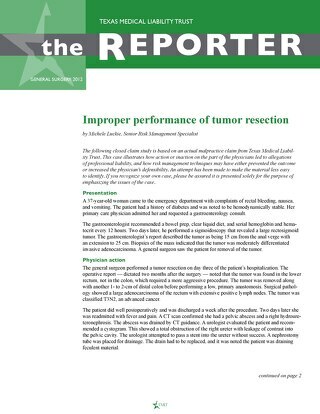 The patient further alleged that the failure to perform immediate revision surgery resulted in the emergence of the infiltrating ductal carcinoma and the continued presence of DCIS in her right breast. This led to more extensive surgery, radiation therapy, and leuprolide therapy. The plaintiff’s general surgeon expert contended that the patient should have been told that she did not have a clear superficial margin. He testified that General Surgeon A and every other physician involved in her treatment had a responsibility to address that situation with the patient. This expert also testified that in the face of the positive superficial margin, the standard of care required revision surgery. He stated that if other surgeons think there is a judgment call in this situation, they are practicing below the standard of care. 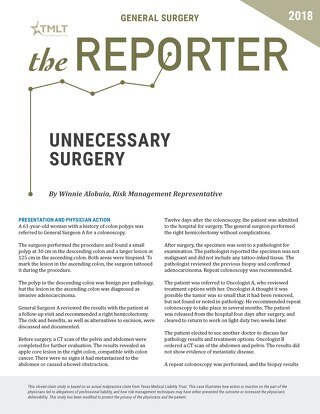 General Surgeon A testified that he was certain he discussed the presence of DCIS in the superficial margin with the patient at the postoperative visit and advised her of options. 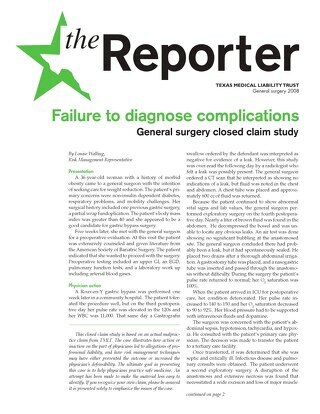 However, a family member of the patient testified that she attended the postoperative visit and the issue of a positive superficial margin was never discussed. General Surgeon A’s dictated note about the postoperative visit indicated the pathology report was discussed. The dictated note listed details from the pathology report. Those details, however, did not contain information regarding the DCIS being present in the superficial margin. The dictated note further indicated that the patient should follow up with Oncologist A for discussion of the pathology report and to follow up with General Surgeon A as needed. 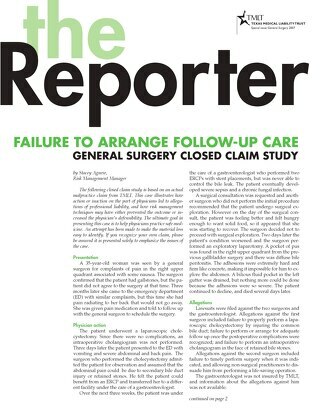 There was no mention of the option of additional surgery to address the positive superficial margin. General Surgeon A also testified that he discussed the fact that the superficial margin was not clear in a phone conversation with Oncologist A. Oncologist A testified that he had no recollection or documentation of such a call. Oncologist A actually noted that the pathology report reflected negative margins. He documented his belief that the DCIS found in the lymph nodes represented artifact and did not require chemotherapy. Oncologist A’s chart contained a copy of the pathology report, which referenced the positive superficial margin. A general surgeon and a medical oncologist reviewed this case and acted as experts for the defendants. They took the position that there is no standard of care that required surgery or radiation due to the positive superficial margin. In addition, the medical oncologist contended that there was no clear evidence that any change in the patient’s treatment plan by General Surgeon A or Oncologist A would have prevented the development of the local recurrence and subsequent therapies. This case was settled on behalf of General Surgeon A. 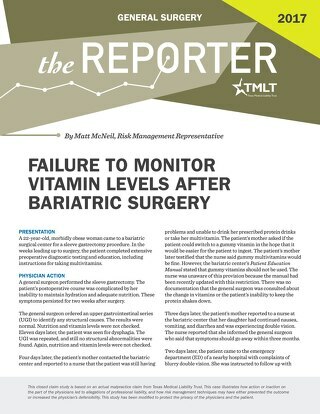 Poor documentation of patient communication was a key element in this case. Although General Surgeon A was certain that he had discussed the positive pathology results with the patient, it was not documented in the chart. 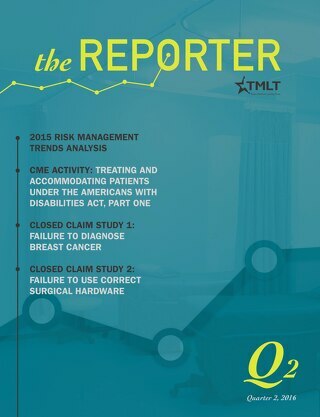 Physicians should document any specific outside test results, education, and advice given to the patient. Electronic medical records can simplify this documentation by creating templates. When using templates, entries should be edited as necessary to ensure the record accurately reflects the care delivered. This may require adding information to the template to make the note unique to the encounter. Additionally, all test results should be initialed and dated by the physician before record filing or scanning. It then becomes clear that results were reviewed in a timely manner. Because essential information about the patient’s assessment and treatment plans are being discussed, it is important to document the name of the person accompanying a patient during an office visit. This is especially vital for pediatric and elderly patients. Having this information in the record can be helpful should there be a question about the care provided. Any discussions with consulting physicians about a patient’s test results, treatment, and recommendations should be documented in the patient’s chart. Documenting these discussions assures accuracy and provides increased defensibility should an adverse outcome occur.